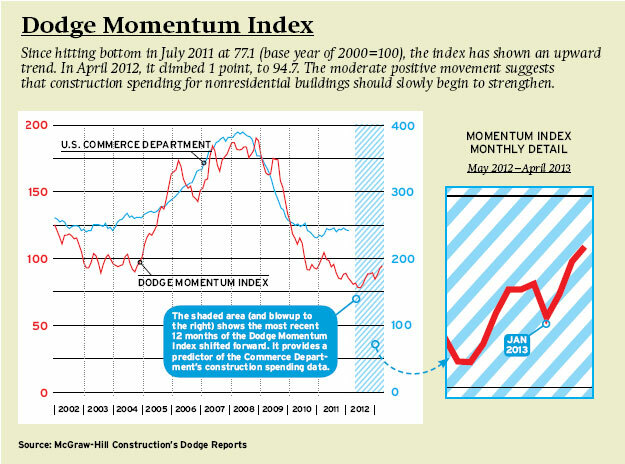 The Dodge Momentum Index is a new 12-month leading indicator of construction spending for nonresidential buildings. Its data is derived from first-issued planning reports in the United States–McGraw-Hill Construction’s Dodge Reports. Because projects in planning may proceed architect selection, it is an earlier indicator of trends than is the AIA Architectural Billing Index. While the index now predicts an upturn in construction sometime next year, its steady decline throughout 2011 and the first quarter of 2012 suggests that there will be continued stress in the industry in the short-term future. One of the most memorable parts of the recent Iron Man movies was the interactive holographic tool Tony uses to design his armor (if you have not seen the movie, watch this). This level of motion-based computing has become a sci-fi staple, and it is easy to understand why. How great would it be to design buildings the same way painters and sculptors create art? The researchers are using a motion-detecting video game console, which many still dismiss as "toys", to control a game so complex that it normally requires specialized keyboards and mouses. The complexity of World of Warcraft controls is equivalent to the complexity of BIM design tools: a set library of functions that can be performed on selectable objects in an interactive, changeable environment. Granted, the controls are rough and hardly ready for "serious players", but that is just a matter of refinement. ...Kinect for Xbox 360 will usher us into a new era Forrester has entitled the Era of Experience. This is an era in which we will revolutionize the digital home and everything that goes along with it: TV, internet, interactivity, apps, communication. It will affect just about everything you do in your home. Yes, that, too. I've just completed a very in-depth report for Forrester that explains in detail why Kinect represents the shape of things to come. I show that Kinect is to multitouch user interfaces what the mouse was to DOS. It is a transformative change in the user experience, the interposition of a new and dramatically natural way to interact -- not just with TV, not just with computers -- but with every machine that we will conceive of in the future. This permits us entry to the Era of Experience, the next phase of human economic development. Meanwhile, IBM is working on Star Wars-style holographic phone calls. They predict that within 5 years the technology will be compact enough to fit in a cell phone. Desktop versions of the technology should easily handle BIM; the models are already designed for simple computer rendering, and are generally more static than a talking human face. In other words, it might not be long before we can design buildings with a few waves of the hand. McQuivey points out that manufacturers will need to join the Era of Experience too. Designers will want to handle virtual models of your product, fit them together to build fantastical structures, and see what happens when they fall down. The companies that succeed in this era will be those that can provide that experience. As a closing thought, the "Era of Experience" idea extends beyond sales tools and computers. The idea of the "Experience Economy" has been around since the mid-90's; I first encountered it as an explanation of why coffee costs so much more at Starbucks than at Denny's. Even deeper than that, though, is the understanding that the experience your clients have with you is part of their experience with your product. Providing a positive experience, which is something above and beyond just providing good customer service, is more important than even the coolest high-tech design tools. The numbers are in, and in Q4 - 2010 the US became the largest user of mobile barcodes. Mobile barcodes, of which QR codes are the best known format, are quickly gaining acceptance world wide. The release also reports a nearly 500% increase in usage over Q4 - 2009. This is further evidence critical mass has been achieved. It can be expected that enough, if not all, US consumers (and those from the other nations in the top 10) are aware enough of what mobile barcodes are, and how to use them, that a mobile barcode campaign is a viable option. To learn more about mobile bar codes, see these posts. Kinect-type hardware for all PCs! PrimeSense, the leader in sensing and recognition technologies, and ASUS, a leading enterprise in the new digital era, announced today that PrimeSense Immersive Natural Interaction™ solutions will be embedded in WAVI Xtion, a next generation user interface device developed by ASUS to extend PC usage to the living room. WAVI Xtion is scheduled to be commercially available during Q2 2011 and released worldwide in phases. There is also a software development kit for designers wanting to create 3D-sensing applications to be distributed through an online App Store. This is the next big breakthrough. Not just for the construction industry, but for the way we use computers. And, since computer tech is getting so small and light, potentially the way we interact with all our tools and devices. One of the products we considered for our annual Top Ten list was the Norton Trinity "Intelligent Door Closer". It did not make the final cut, but only because we realized we were more excited about the implications of this type of technology than the actual product. Trinity is a door closer with a self-powered on-board computer that monitors room temperature and adjusts door closure rate to compensate. In and of itself a very cool advancement, but the bigger story is the computerization of such a small, background piece of equipment. This is not a computer hooked up to a door so it can open, close, and lock remotely; this a computer in the actual door. Now combine that with Kinect-style motion controls, and an ever more sophisticated library of gesture recognition. Imagine a sink that can see you pull your hands away in shock from scalding water, and adjust the temperature to compensate. Imagine lamps that increase lighting when you pick up a book, then turn it down when you lie down to sleep. Imagine phase-change windows that become opaque or translucent based on your gesture.